The leader is in charge of developing the dance. While there is a certain type of accomplishment in pulling multiple patterns from memory, accomplished tango dancers will generally agree that it is superior to acquire the skills that will provide the forum for improvisation. Each single step provides the opportunity for another. At any time the leader can switch between systems (parallel to cross systems) by changing weight, to provide a different perspective. Movements can change from linear to circular or circular to linear provided the set up is correct. Invasions can occur at virtually any time. The only element that restricts or prohibits improvisation is the preceding step. Each move that ends without attention to precision of the alignment of the axes limits the alternatives that can follow. Sloppy dancing tends to dictate subsequent less challenging moves and exiting through the salida and even resolution to regroup. Complexity in improvisation demonstrates skills in imagination too but the underlying ability is technique: Technique that keeps the frame intact, the axis of both leader and follower uncompromised, and the practiced skill of reading subtle body language. Argentine Tango traditionally is a cultural, social dance; danced for enjoyment, fulfillment of the soul and replenishment of the spirit. It calms the nerves, soothes emotional upheaval, provides a ‘safe place’ to be intimate and feel love. The dance floor is where individuals meet. They leave restored. Results are temporary so dancers return regularly to re-capture the sensation of love which is a virtually indescribable sensation that combines physical closeness with an ethereal connection. The ultimate objective is the exquisite, intangible connection. The conduit is a combination of many elements: music, physical touch, movement, expression, respect, submission, and gentle protection. We can establish the elements with ease, set the stage as it were, but achieving the essence of Argentine Tango is not so simple. An occasional successful ‘connection’ encounter cannot be accurately described because no words suffice to adequately interpret the experience. In America today people are not interested in the physical and emotional intimacy aspects of Argentine Tango. They prefer not to feel vulnerable and do not want to expose their innermost self with complete strangers. And yet at the same time they seem rather emotionally hollow, disconnected, and believe that intimacy is exclusively carnal sexuality. Sadly, the dance of Argentine Tango is now following the course of other couple dances. The elements that once clearly separated Argentine Tango through its disciplined excellence are now almost completely avoided. It has been reduced to The Competition. 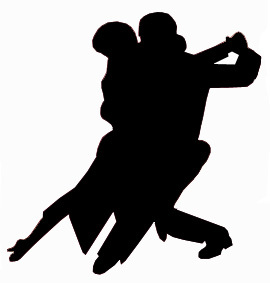 If the true heart of Argentine Tango is the rather esoteric unifying of persons otherwise unknown to one another, being able to express themselves in a combination of movement and music, in perfect harmony, exhibiting an intimate, ethereal connection, competition has no way to filter out the winners from the losers. As one of the greatest proponents for technical acuity I believe dancing skills can be measured as they are visibly apparent to the observer or judge, but technical skills alone do not constitute the entirety of the dance. The level of connection achieved is something private and known only to the dancers. While the music is playing let’s tango some more. The best gift for an artist is a clean canvas. The artist does not necessarily have to immediately pick up his brush. Inspiration strikes when the right catalyst comes along. Choreography requires skill and practice to reproduce the same elements consistently well. There is little if any freedom in a choreographed dance. Choreography has many purposes including showcasing, striving for a higher level of perfection of a single sequence, and comparison (competition). The element that is missed by choreography is improvisation. Coloring between the lines, perfectly or loosely, even mixing colors still results in the same basic image. There is nothing unique about the finished result - the design, the image was predetermined. If a single figure is considered a 'dot' then joining the dots produces a more random choreography and challenges transitional skills, but each picture will contain the same elements as only so many dots fit on a page - only so many figures can fit into one dance. The dancer who 'needs' choreography to achieve a dance is not using his skills to create art, rather allowing the tools to dictate the art. The improv' artist uses all elements of skill - with the exception of repeating the same sequence: An artist sketches still life subjects to develop skills in recognizing and creating shapes, consideration of the light source, how shadows are caused, the point of infinity, perception, depth and focus. The artist who creates from within (improvises) uses these elements of acquired skill but he does not need a subject. The artist employs imagination, available tools and honed skills. What triggers the imagination? Music. Familiarity with orchestral styles, rhythm, phrasing and nuances will trigger mood and offer recognizable opportunities. Moreover, familiarity with the music provides a sense of security. Recorded music never changes; the dancer can trust the tempo, the phrasing, the cadence and the pauses to always be there and that other tunes played by the same orchestra will offer the same style. Leading a dance by an unknown composer or orchestra takes courage as there may be nuances that catch the leader off guard. Variations of a tune by the same name are numerous and great and can be almost unrecognizable. Acquiring skills takes time but gradually they can be implemented in a natural way without planning or preparation. True improvisation happens in the moment; compelled by the senses to initiate and provoke the use of acquired dexterity to impart expression. Learning a (foreign) language can be accomplished many ways; some of us might pick up a dictionary of useful phrases – just enough to get by for a couple of weeks in a foreign country, others may enroll in college classes to learn vocabulary, grammar, sentence structure and colloquial nuances. There are people who learn by repetition and others who learn by comprehension, and of course, there are many variables. Tango is a language – a body language – and it can also be approached in multiple ways. A dancer who learns useful phrases (possibly dozens of them) and strings them together, trying to fit them to the music but not always successfully. The Tango Tourist struggles with improvisation. The dance becomes a series of prepared, choreographed sequences or figures which may be danced in a variety of orders but which unavoidably hold an element of predictability. The dance becomes repetitive and lacks luster but the opportunity for social interaction may be huge. A dancer who takes classes and workshops endlessly, jumping from one technique to another, without appreciating the different approaches: classical, traditional, modern or historic. Nonetheless, the Tango Fanatic develops an enviably wide repertoire of moves and an eclectic style. Dancing with a Tango Fanatic might feel disjointed and can certainly be challenging. The dancer lacks consistency but will have endless stories to tell from a wide variety of influences. A dancer who studies the dance through a disciplined approach. The first step is to learn the alphabet and form words. Next is to establish a vocabulary from which to create sentences. Sentence structure requires grammar and punctuation. The Tango Aficionado can select words and create sentences, paragraphs and short novels that express individuality. Patterns are improvised in the moment, express emotion in response to the music and may be forgotten instantly. The dance is never repeated; it is executed with precision and style demonstrating skills of fluidity, form and honed technique while conveying a personal expression. At Tango Fantástico the approach is to encourage expressive and fluid dancers who can create and improvise using the skills of practiced technique. A Tango Tourist can always repeat a phrase and pass it along to another. They may not know the skills or technique that would improve it or provide an alternate ending but a general idea can be passed around. A Tango Fanatic may be capable of selecting portions of different sequences and splicing them together. Variety is the spice of life but unfortunately the dance may become disjointed. A Tango Aficionado may be hard pressed to repeat a wonderful improvised sequence – the moment is gone, the feeling has passed and the reward lingers only a short time as a residual effect. It depends on the personalities involved. This is why we must allow for all tango dancers to share the floor – each was inspired in a unique way and therefore they will be drawn to the features that so inspired them. Some will evolve. The maestros have all endured some form of discipline, structure and measured progression. None has arrived at a revered position without extraordinary effort in developing individual technique and skills. And though they may have long since transcended the grueling path to success, we need to respect that physical perfection takes a great deal of work and focus, and recognize that a maestro cannot impart what took years to acquire in one or two workshops.